I met Lorena thanks to my friend Allan Gorman and on top of being an amazing painter, I admire her involvement in sharing her passion for art either through her book, the founding of the International Guild of Realism or her writings for PoetsArtists. I am thankful that she could find some time to share about her work! You’re a painter, a sculptor, a curator and a writer… How do these different aspects of your work live together and how do you find a balance between them? My days revolve mainly around painting and writing—both offer parallel outlets of creative expression as well as technical challenges, and both are easily balanced as I switch back and forth between them. I absolutely love painting—I see it as a very intimate pursuit which solely relies on personal choices, decisions, and limitations. I love being alone, so painting is perfect for me. I paint for myself—in other words, my painting is never done with others in mind, I try not to be influenced by outside opinions and doggedly hold on to my own visions. My writing, on the other hand, is much more of a communal endeavor even if it happens in seclusion. Writing for me is a vehicle to connect with others; with each sentence, I reach out to the outside world. I wrote a book entitled Painting in Acrylics: The Indispensable Guide, which deals with all the technical and how-to aspects of painting in acrylics. Since its worldwide publication, the feedback has been tremendous; I receive emails every week from readers from around the world sharing their thoughts, comments, and artistic progress. 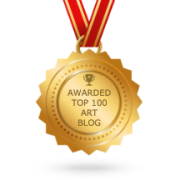 Currently I write a monthly art review for the independent art magazine PoetsArtists, for which I interview artists or review an exhibition to shine a spotlight on other creatives and their work. It has been a while since I sculpted but I’m very proud to have several public statues in my hometown of Wassenaar in The Netherlands. What I dislike about sculpting is my dependence on a skilled, trustworthy bronze caster and foundry to convert my wax sculptures into bronze. Still, I hope to get back into it again in the future, I’d love to make a series of small decorative objects d’art. Recently I’ve been invited to curate a special issue of PoetsArtists Magazine, which is a great honor. Even though I’ve juried before I consider this to be my first real curatorial undertaking and it definitely pulls me out of my comfort zone. I’m very excited about this opportunity to select artwork to fit a specific theme that’s close to my heart, yet at the same time I’m bracing myself thinking of the inevitable rejections I will have to dish out. I’ll do my utmost best to squash my tendency towards personal empathy and am determined to only select the works that most speak to me. I’m looking forward to learning a lot during the process. Your recent series Tempus ad Requiem include birds in still life. Can you tell me about the symbolic meaning of these paintings? Tempus ad Requiem means ‘Time to Rest’ in Latin. This series of still lifes featuring birds perched on ceramic or glass objects symbolizes the need for a time and a place to rest, to come to terms with life’s hurdles and replenish our energies. The central message could be described as a reminder—not only to the viewer but also myself—that it’s important to take the time to sit quietly, to enjoy the beauty of the simple things in life, to be more appreciative and self-reflective. My aim is to present an image infused with serenity as a cue to briefly pause the daily rush, silence the sensory overload, and luxuriate in a moment of hushed quietness. I’m fascinated with the symbolic meaning given to objects, animals, and materials among different cultures. Bird breeds have their own symbolism too, such as for example the Blue Jay in Tempus ad Requiem V—a highly intelligent and adaptable corvid—represents the teaching of knowledge and survival. So, besides the overall symbolic message expressed in the title, each painting also contains a hidden wish or aspiration that, I like to imagine, is universal. In the case of the Blue Jay, the desire is to learn how to utilize our greatest abilities to their fullest potential. You’re a founding member of the International Guild of Realism. How did this happen and what is its mission? In 2004, while living in Scottsdale, Arizona, I met fellow artists Don Clapper and Larry Charles who came up with the initial idea to set up a group for realist artists—an idea I supported wholeheartedly. They needed someone to organize the paperwork, streamline membership, set application guidelines and exhibition entry procedures, create a website, and handle the day-to-day communications between the Guild and its members. I worked behind the scenes on a daily basis for seven consecutive years and kept the project going through many ups and downs. In 2007 I moved back to Europe so it got increasingly harder to balance my long-distance workload for the Guild with my art career. So in 2011 I finally decided to take a step back, retiring, so to speak, into lifetime membership. Fortunately, others took over the torch to assure the continuation of this initiative and keep the flame burning. I’m proud of my role as founding member and very happy that the Realism Guild is still going strong—now in its 13th year—in line with its mission to advance realism in fine art through its annual gallery shows and occasional traveling museum exhibitions. The International Guild of Realism continues to recognize the best realists working today and to offer exhibition opportunities in the US for realist artists from all over the world. Can you share about your artistic process? For a painting, I usually start out by setting up compositions with various glass, ceramic, or metal objects, either from my own collection or borrowed. I’m inspired by beautiful artisanal pieces, preferably with some history to them, and look how those textures, colors, and shapes interact with their surroundings. Then I take a series of digital photographs from which I select images that seem most interesting and balance shadows and highlights. I further crop, manipulate, and enhance the images on my computer, and, in the case of the Tempus ad Requiem series, I add birds. I take ample time to prepare my supports to achieve a smooth surface and transfer the image. The painting process is very meditative, it’s building up layers of mostly transparent colors, pushing and pulling until I achieve the desired color depth and values. I plan every step along the way, often visualizing my gestures before I put brush to painting. Decisions on what to depict and what to leave out, and choices of color palette allow me plenty of freedom to truly make the still life my very own. Lately I’ve been using the airbrush to achieve soft subtle gradations in the shadows, but mostly I use brushes. Once finished, I sign my work, varnish, photograph, and catalog it. And I always write a little paragraph about its symbolism, just in case a collector wants more background information. When I write I usually start a piece with a “sketch” of loose words and short sentences that capture the essence of what I want to say. I’ve noticed there’s a parallel between my painting and writing methods, because here too I start with an outline and then fill in the empty gaps between thoughts and messages with words. I’m looking for beauty in easily readable sentences that tie one thought to the next. I endlessly ponder on vocabulary, terminology, language, the sounds, punctuation—agonizing over how everything connects while trying to achieve flow. I want to capture the reader’s attention, spark their interest so they want to read on. When I write, I do so for the reader. When I paint, I do it for myself. What do you like most about your work? I most enjoy the solitude, the freedom, the self-determination of my artistic activities. I like competing with myself to see whether the current piece will exceed the last piece in my expectations regarding beauty and technical skill level. It is pure luxury to be able to work at my own pace, set my own deadlines, and not be encumbered by external pressures or expectations. Who are your main artistic influences? I’ve been fortunate to have been exposed to great art from an early age and every piece that ever took my breath away has left its mark. I’ve always been attracted to realism, in all its forms and expressions. Despite the best efforts of more sophisticated artist friends who’ve tried to educate me on the matter, I’ve never quite understood abstract non-figurative art and mostly find myself repelled by it on an esthetic level. My ideas and ideals of beauty have been greatly influenced by Victorian painting, in particular the Pre-Raphaelites and the Aesthetic movement. I’ve loved Gustav Klimt, Alphonse Mucha, and Salvador Dalí since I was a child. At age twelve (1974) I saw my first photorealism exhibition (Kijken Naar de Werkelijkheid) at the Museum Boijmans-van Beuningen, in Rotterdam, the Netherlands. I didn’t realize it at the time but seeing the great masters of American photorealism (especially Richard Estes and Chuck Close) in person must have deeply influenced my painting style. While it was never my intention or aim to paint that way—I simply never imagined I would be able to attain such skills—today my paintings are often mistaken for photographs. Needless to say, I’m not comparing myself to the great photorealists yet it is obvious to me now that their impact and influence has been far greater than I imagined. What are your other projects for 2017? I’ll continue painting and writing, of course. My work will participate in several juried exhibitions and invitationals, although I’m trying to slow down my exhibition pace this year. I plan to paint a few private commissions—on average I accept about three each year, usually those that grant me carte blanche. I love meeting artist friends and see some exhibitions so I’m looking forward to traveling a bit for that. And, as always, I’ll be on the lookout for new opportunities and projects regarding the arts and writing!